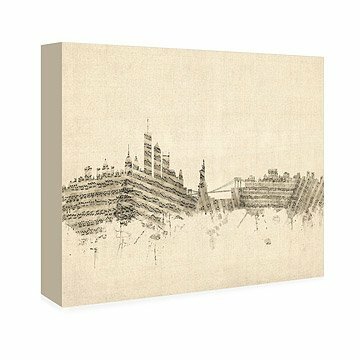 These prints combine favorite cityscapes with musical notation. From Boston to LA, every city evokes its own rhythms, tones, and melodies. This print by Michael Tompsett combines the distinctive skyline of your favorite city with the architecture of musical notation for a captivating, graphic representation of vibrant cityscapes. Tompsett's composition is reproduced through a giclee print on gallery wrapped canvas. The geometric forms and neutral palette make it complementary to any decor. It makes a great gift for music lovers, whether they left their heart in San Francisco or they're in a New York state of mind. Click here to see an image of available skylines. Click here to see the Musical Skyline Art - Small. Art and design has interested Michael Tompsett since an early age, so much so that art class was the one lesson at school he genuinely looked forward to every week. After school and university he had the fortune to be able continue his passion, working as a senior designer at Conde Nast Publications in London. After an exhilarating 12 years he bid farewell to his job and England, and moved a couple of thousand miles south to Spain which he now calls home. He now dedicates himself full time to his artistic pursuits in the tranquil and idyllic surroundings of a Mediterranean coastal village. Great item but wish artist name was on it.